Brett Pitman's first-half goal earned Bournemouth a deserved first away win of the season at Doncaster Rovers. 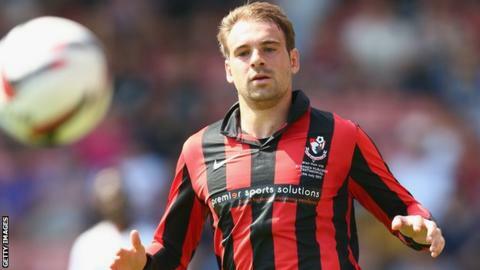 The Cherries striker nodded in the game's only goal after meeting Charlie Daniels' free-kick. In a feisty affair at the Keepmoat Stadium, Doncaster manager Paul Dickov appeared to move his head towards Bournemouth boss Eddie Howe as they exchanged words on the touchline. James Coppinger fired wide late on for Doncaster when he snatched at a chance. After conceding 11 goals in their last two away trips to Watford and Huddersfield, Bournemouth were keen to improve their away form, which was undoing their good work at home where they boast a 100% record. And with Pitman crashing a diving header off the bar after Ryan Fraser had a shot saved by Doncaster goalkeeper Ross Turnbull, theirs was the brighter beginning. Pitman then opened the scoring in the 31st minute when he turned Daniels' free-kick home for his first goal of the season after James Husband fouled Fraser. Husband appeared to get a touch on the ball amid a scramble in the area but the Bournemouth striker claimed the goal. Doncaster's David Cotterill and Bournemouth's Pitman were then booked for rash challenges in a lively period that saw Dickov and Howe in animated discussion on the touchline. After the break the game calmed down on and off the pitch before Richie Wellens sent an 18-yard shot high for Doncaster with just over half an hour left. Turnbull then saved from Lewis Grabban to keep Doncaster in the game but Dickov's side could not find an equaliser. "The difficulty is, when you're beaten heavily like we were, and then say you're pleased with elements of the performance, people think you're lying. "Today there were elements of those performances in there, but we defended better than we have done. "After the last two games questions were going to be asked and we responded very well. We needed to, for the fans and the players." The one thing I will do is take getting beat if the team of players try to do what we want them to do. "Whether this was a case of too many of them having an off day or too many getting complacent, that's a question I have to answer. "If anyone has seen us play, even when we have lost we have created stuff and passed the ball. Today we were devoid of intensity."